Hera Hilmar stars in MORTAL ENGINES. Lots to cover on this week’s show as award season races toward the finish line for BOFCA! First up, we hear from Dave who calls in with his thoughts on BALLAD OF BUSTER SCRUGGS (2:00). Then Kris makes a hard case for SUPPORT THE GIRLS (8:25), which was a hit on the festival circuit but ought to be way more widely seen. Evan then walks us through MONSTERS AND MEN (19:07), a pretty good take on a story that has nonetheless been covered in more interesting and absorbing ways by other films this year. Kris saw BATHTUBS OVER BROADWAY (28:56), a delightful story about one of the oddest phenomena in American entertainment: the industrial musical. Evan saw INCREDIBLES 2 (35:23) — surprise surprise, it’s good — and Kris wraps things up with MORTAL ENGINES (41:57) — surprise surprise, it’s not. On this week’s episode, Dave and Kris are still in the process of recovering from various plagues (Apologies for the occasional coughing! ), but that doesn’t slow them down from getting to the bottom of this week’s releases. First up is Kris with an installment of Keepin’ Up with the Jensons, revisiting THE KILLING OF A SACRED DEER (4:50). Rather than rehash the plot, Kris ponders the point of it all, with some unsatisfying conclusions. Next up, Evan walks through ROMAN J. ISRAEL, ESQ. (9:24), the new film from NIGHTCRAWLER director Dan Gilroy featuring Denzel Washington and Colin Farrell. It’s not necessarily a bad film and it boasts some fine performances, but it ultimately suffers from a terminal case of not having a firm grasp on its own point, leading to an uneven tone and baffling plot twists. Last up is Dave and Kris with COCO (30:09), the new Pixar film guaranteed to make you cry. It’s a delight to behold that is gorgeous and heartfelt despite some issues of predictability, and is a welcome addition to the Pixar tradition of finding worthwhile, emotional stories in just about anything. Check out this week’s episode of Spoilerpiece Theatre! FINDING DORY hits the minimum bar that Pixar sets. It’s good, but not great. On this week’s show Dave explains why a certain French filmmaker is just “too French.” Then Kris and Evan dive into FINDING DORY (at 4:50), a film that hits the lowest bar Pixar sets: it makes you laugh and cry at some point. However the movie didn’t make much of a splash with them, which is why they end up in Tangenttown making comparisons to JOE DIRT and TAKEN 2, in between talking about individual scenes that work well. At least a conversation on the use of baby voice leads to a cute Baby Henry story. Next up, the guys discuss FERRIS BUELLER’S DAY OFF (at 31:04) because of its recent 30th anniversary. They offer their revisionist take on the movie by revealing why Ferris is an arrogant unsympathetic character in an otherwise objectively funny picture. Evan wraps up by sharing his experience seeing THE UNTOUCHABLES (at 44:50) on the big screen for the first time. It’s a lot bloodier than what he remembers from many afternoon viewings on TNT, but he still enjoys its many exciting scenes, and doesn’t hesitate to describe them using his best Sean Connery impression. Don’t be surprised if some Celebrity Jeopardy SNL references end up in there too. Episode #72: CREED, THE GOOD DINOSAUR with bonus PLANES, TRAINS, & AUTOMOBILES, and every ROCKY movie! CREED is fantastic, and so is Michael B. Jordan. Happy Thanksgiving! We at Spoilerpiece couldn’t help but launch into a short riff about the beauty of John Hughes’ PLANES, TRAINS & AUTOMOBILES. It’s that time of year, and it’s also funny to hear Steve Martin say, “I do not play with my balls.” Then Kris and Evan get into THE GOOD DINOSAUR, which, to hear them tell it, ain’t a good movie. And finally, Kris spoilerpieces the hell out of CREED, the new ROCKY movie that is apparently better than it has any right to be. There’s also a Henry update and a brief installment of “Riedel’s Recaps.” Hope everyone didn’t eat themselves sick! 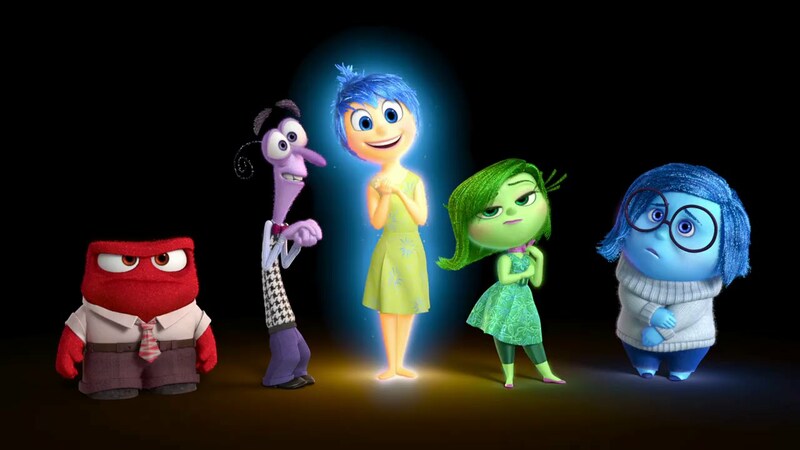 The perfectly cast characters of INSIDE OUT: Anger, Fear, Joy, Disgust, and Sadness. Charlie Nash of Movie Mezzanine, Edge on the Net, All Things Horror, and Cinematic Essential joins Evan and Kris this week to take on INSIDE OUT, DOPE, and ME AND EARL AND THE DYING GIRL. The guys start by bitching about jerks who spoil GAME OF THRONES before they share why Pixar’s film INSIDE OUT moved them to tears. All three enjoyed it so much that they can’t think of a single bad thing to say about it. Next up, Kris and Charlie summarize DOPE, while attempting to separate its promising parts from the misfires it makes and detours it takes. Then they wrap things up with the abhorrent ME AND EARL AND THE DYING GIRL, a picture that’s so bad it makes Kris angry for once. He and Charlie spoilerpiece what makes it so awful for Evan, which gives him some pretty awful ideas of his own for what to do with it when it comes out on DVD.